The second half of the 2013 IAAF Diamond League really came alive when Bohdan Bondarenko made a sensational breakthrough in Lausanne. The Ukrainian high jumper became one of the stars of the season, not only winning the world title in Moscow but also taking the overall Diamond Race victory in his event. 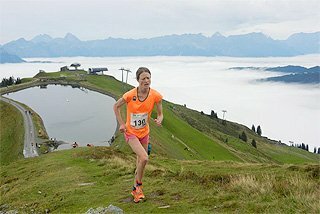 The finals in Zurich and Brussels brought the series to an exciting climax as a host of Diamond Race winners were revealed. Most notable among them were French pole vaulter Renaud Lavillenie and Kenyan steeplechaser Milcah Chemos, both of them winning the Diamond Race for an unprecedented fourth consecutive year. Just a week after adding three centimetres to his high jump personal best in Birmingham, where he had won with 2.36m, Bohdan Bondarenko raised the bar to a dramatic new level as he produced a winning leap of 2.41m that lifted him to equal third on the all-time lists and bettered by one centimetre the Ukrainian record set in 1985 by Rudolf Povaritsyn, who was the first man to jump 2.40m. The mark was also the best recorded since 1994, and a Diamond League record. Most of the field exited the competition at 2.33m but Bondarenko passed that height and cleared 2.35m on his first attempt. Olympic silver medallist Erik Kynard, the only other athlete left in the competition, then took the lead with a first-time clearance at 2.37m, a personal best. His rival responded straight away by jumping 2.39m with a huge clearance over the bar. It was clear to Kynard that he had to go higher. After one failure at 2.39m, Kynard then missed twice at 2.41m. Bondarenko, whose exploits by now had captured the full attention of the capacity crowd, then sailed over 2.41m on his final attempt before making three good attempts at a world record height of 2.46m. Aided by a perfect 2.0m/s tailwind, Tyson Gay held off a strong challenge from Jamaica’s former world record-holder Asafa Powell to win the 100m in 9.79. Sandra Perkovic, Croatia’s Olympic discus champion, confirmed victory in the Diamond Race with a fifth consecutive win, although she had to work hard to surpass Cuba’s two-time world silver medallist Yarelis Barrios, who led temporarily with 67.36m, the second-best mark of her life. With the next throw of the competition, Perkovic responded with 68.96m, just 15cm short of her personal best, and breaking her own Diamond League record of 68.77m from Stockholm in 2012. Abeba Aregawi also secured the Diamond Race win in the 1500m after an easy victory in 4:02.11. Usain Bolt produced a world-leading 200m time of 19.73 at the Stade de France, witnessed by a capacity crowd of more than 52,000 spectators. Fellow Jamaican Warren Weir was second in 19.92 with France’s former European champion Christophe Lemaitre third in 20.07. “I love Paris, I always feel wonderful here. 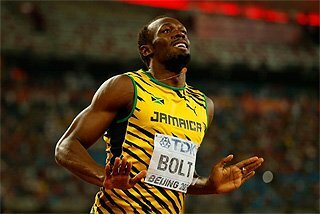 As you see, I’m getting there,” said Bolt, clearly still sensitive about the criticism he suffered earlier in the season immediately before and after his surprise 100m defeat at the IAAF Diamond League meeting in Rome. There were also world-leading performances from Kirani James in the 400m (43.96), Ethiopia's Tirunesh Dibaba in the 5000m (14:23.68), Ezekiel Kemboi in the 3000m steeplechase (7:59.03) and Zuzana Hejnova, who secured the Diamond Race victory in the 400m hurdles with a national record of 53.23. 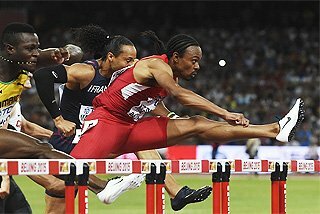 James held off the challenge of his predecessor as world and Olympic champion, LaShawn Merritt, with the second-best time of his career, while Merritt finished in 44.09, his fastest time since winning the 2009 world title. Dibaba’s winning 5000m time was also a meeting record and the seventh-fastest ever run over the distance. 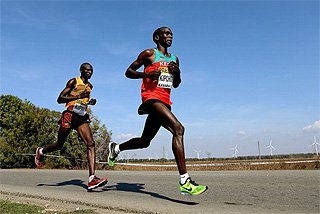 Kemboi waited until 250m from the finish before taking the lead from the Frenchman who had finished behind him in silver medal position at the London 2012 Olympics, Mahiedine Mekhissi-Benabbad. The eccentric Kenyan would have finished even faster had he not supplied one of his show-boat finishes 20m from the line, drifting into the second lane with his arms held wide. 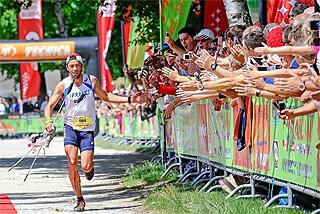 Mekhissi-Benabbad held his form to set a European record of 8:00.09, an improvement on the former continental standard of 8:01.19, which had been held since 2009 by his compatriot Bouabdellah Tahri. Hejnova’s victory was enough to secure her the Diamond Race victory in the 400m hurdles. Djibouti’s Ayanleh Souleiman won the 1500m in 3:32.55, 0.01 ahead of Ethiopia’s Aman Wote, and Shelly-Ann Fraser-Pryce held off the challenge of Blessing Okagbare to win the 100m in 10.92, with the Nigerian clocking 10.93. Russia's world and Olympic champion Anna Chicherova won the high jump with 2.01m. Asbel Kiprop became the fourth-fastest 1500m runner of all time as he won in 3:27.72, with Britain’s Olympic 5000m and 10,000m champion Mo Farah setting an astonishing European record of 3:28.81 behind him on a night which produced seven world-leading performances. Within the Diamond League framework, Kenyan Edwin Soi’s 5000m time of 12:51.34 and Vitezslav Vesely’s javelin throw of 87.68m joined the world-leading efforts of Renaud Lavillenie, who won the pole vault with 5.96m and Amantle Montsho, who won the 400m in a national and Diamond League record of 49.33. The men’s 1500m was not a Diamond Race-counting event on this occasion, and nor were the two sprint relays which began the track action and produced world-leading times of 37.58 and 41.75 respectively for the US men’s and women’s quartets. A near-capacity crowd at the Stade Louis II witnessed an exceptional 1500m race which saw Farah follow the tall and upright Kenyan home, thus breaking the European record of 3:28.95 set by Spain’s Fermin Cacho in 1997, and the British record of 3:29.67 set just along the coast in Nice in 1985 by Steve Cram. Brigetta Barrett celebrated victory in the high jump – where she defeated Russia’s Olympic champion Anna Chicherova with an effort of 2.01m – by performing a well-rehearsed version of For Once In My Life before the final firework display. The women’s long jump was also a competition of the highest quality as Russia’s European indoor champion Darya Klishina produced a second-round leap of 6.98m, just seven centimetres off her personal best, only to see Nigeria’s Blessing Okagbare outdo her with successive seven-metre jumps – a wind-assisted 7.04 (2.1m/s) in round two and a third-round personal best of 7.00m (0.0m/s). The men’s 5000m was won in dramatic style by Soi, who passed Bahraini junior Albert Rop as they came into the final straight and maintained his lead under heavy pressure to cross in 12:51.34, the best in the world this year and a meeting record. Rop’s reward for his persistence was a senior Asian record of 12:51.96. A year on from the London 2012 opening ceremony, a capacity crowd of 60,000 witnessed the Olympic stadium celebrate its birthday with two world-leading marks and Usain Bolt’s fastest 100m time of the year. Newly branded as the London Anniversary Games, this meeting was an opportunity to see two days of action before the stadium’s shutdown for two years of re-configuring ahead of the 2017 IAAF World Championships. Of the 11 Olympic champions on show on Friday and Saturday, two of them enjoyed ‘encore’ wins on day one, and none attracted more attention than the 100m gold medallist Usain Bolt, who crowned the evening by running his the 100m in 9.85 despite what he described as a “horrifying start”. World-leading times came from the Czech Republic’s Zuzana Hejnova in the women’s 400m hurdles, where she lowered her national record to 53.07 ahead of home runner Perri Shakes-Drayton, who ran a personal best of 53.67, and the United States’ Shannon Rowbury, who won the 3000m in 8:41.46. Bohdan Bondarenko provided one of the highlights of Friday night by winning the high jump with 2.38m after another close battle with Olympic silver medallist Erik Kynard. Cuba's Yarisley Silva achieved her second consecutive Diamond League victory over Jenn Suhr and Fabiana Murer, beating the Olympic and world champions with a Diamond League record of 4.83m. Bolt wasn’t the only Jamaican sprinter reliving London 2012 glories, for Olympic bronze medallist Warren Weir led compatriot Jason Young to the 200m line in 19.89, as both men dipped under 20 seconds. Kirani James produced a well-paced piece of 400m running to become the only other London 2012 winner apart from Bolt to repeat his Olympic victory, clocking 44.65. Ethiopia’s Meseret Defar would have preferred to have raced over 5000m, the distance at which she had won consecutive Olympic and World titles, but she made the very best of the scheduled 3000m race to win in 8:30.29. At the bell, Defar had her compatriot Genzebe Dibaba, the world indoor champion, on her shoulder, with the Kenyan who had followed her home for silver at the IAAF World Championships in Moscow’s Luzhniki Stadium, Mercy Cherono, also close. 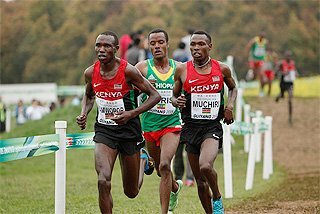 However, Defar turned the screw as they entered the final bend and crossed five metres clear of Cherono, who clocked a personal best of 8:31.23. On a chilly evening, but with a near-capacity crowd in the 1912 Olympic Stadium, eight of the top nine high jump finalists from the Moscow did battle here again – and once again Svetlana Shkolina came out on top to continue her unbeaten record this season as her fellow Russians Anna Chicherova and Mariya Kuchina took second and third place. Shkolina had first-time clearances at 1.90m, 1.94m and 1.98m before failing at 2.01m, but only Chicherova joined her in attempting that height, and the Olympic champion’s earlier failed attempt at 1.94m saw her take second place on count-back. Moscow bronze medallist Mariya Abakumova became a member of Stockholm’s Diamond Club after bettering Trine Hattestad’s 13-year-old javelin stadium record of 67.92m with a winning effort of 68.59m. The Czech Republic’s world 400m hurdles champion Zuzana Hejnova joined her as winner of a 1-carat, US$10,000 diamond after beating the meeting record of 53.74 set in 2011 by Jamaica’s Kaliese Spencer, as she won in 53.70. The final race of the night, over 800m, involved Sweden’s world 1500m champion Abeba Aregawi but was conclusively won by the Kenyan who won the world title at that distance in Moscow, Eunice Sum, in 1:58.84. 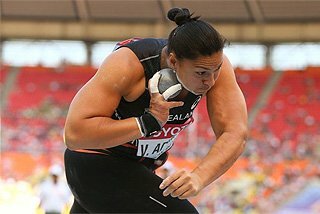 World shot put champion Valerie Adams secured her 40th consecutive competition victory with a third-round effort and stadium record of 20.30m. Meseret Defar’s outstanding 5000m win over her compatriot Tirunesh Dibaba and Bohdan Bondarenko, bringing the Letzigrund Stadium to a standstill as he attempted again to improve the high jump world record, provided the highlights of the first of this season’s IAAF Diamond League finals. In total, there were 15 Diamond Race trophies awarded along with the US$40,000 first prize that accompanies them – the women’s shot put winner Valerie Adams was crowned on the previous day – before another sell-out crowd of 26,000 in Zurich. 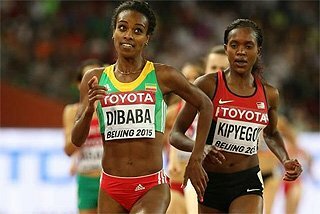 Defar and Dibaba, the 5000m and 10,000m gold medallists respectively from the 2013 IAAF World Championships, were brought together to battle for supremacy over the shorter distance, something that had not happened in Moscow. 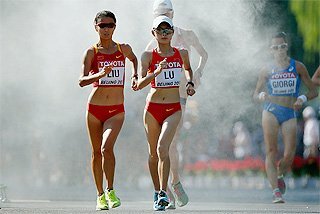 It was just their fourth race against each other since the Beijing Olympics five years ago. Dibaba may have come in as the world record-holder and 2013 world leader, but it was Defar who prevailed in a thrilling last lap, finishing just under two seconds in front of her Ethiopian compatriot and rival in 14:32.83. Defar’s win meant that she was also victorious in the Diamond Race and added a $US40,000 first prize as well as the Diamond Trophy, which all winners received at the end of the meeting. Usain Bolt won the 100m in 9.90, but the Diamond Race went to US sprinter Justin Gatlin, third on the night in 9.96, a reflection of his season-long consistency. In the women’s 200m, Shelly-Ann Fraser-Pryce won in 22.40 with Murielle Ahoure second in 22.66. 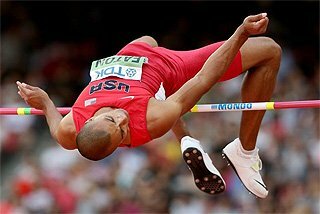 Bondarenko had already secured the Diamond Race after winning the high jump with an effort of 2.33m, and he then asked for the bar to be set at 2.46m before requesting silence from the crowd for his 11th attempt in the last two months at Javier Sotomayor’s two-decade-old standard of 2.45m. However, the record abides. Silas Kiplagat won the 1500m in 3:30.97. Djibouti’s Ayanleh Souleiman finished second in 3:31.64 but had already won the Diamond Race. Zuzana Hejnova won her 400m hurdles race in 53.22 to take her unbeaten run to 11 races in this event this season, and another world champion hurdler, David Oliver, won the 110m hurdles in 13.12. It was the third consecutive Diamond League win for Oliver and helped him regain the Diamond Race he had won in its inaugural year of 2010. Fellow US athlete LaShawn Merritt was another man who added US$40,000 to his bank balance after winning the 400m in 44.13. Maria Abakumova won the javelin with 66.91m but world champion Christina Obergfoll, second with 63.36m, had already secured the Diamond Race. World long jump champion Aleksandr Menkov had also secured the Diamond Trophy before the meeting, and finished sixth in a competition which marked the final competitive appearance of four-time world champion Dwight Phillips, who was given a special award by IAAF President Lamine Diack in honour of his achievements. Gerd Kanter, the 2008 Olympic champion, could only take the Diamond Trophy if he won the discus and Piotr Malachowski finished outside the top three and that is exactly what happened after the Estonian threw a season’s best of 67.02m in the third round while Malachowski was seventh with 63.70m. World champion Robert Harting reached 66.83m in the fourth round but it was just 19cm short of the mark which would have given him the win and, instead, made him the Diamond Trophy recipient. Diamond Trophies in the women’s pole vault and long jump went respectively to Silke Spiegelburg and Shara Proctor. Kenya’s Eunice Sum won the 800m Diamond Trophy after winning in 1:58.82, just 0.11 ahead of the Russian she beat the to the world title, Maria Savinova. In the men’s 3000m steeplechase, Conseslus Kipruto secured the Diamond Trophy with third place. Usain Bolt was upstaged by fellow Jamaican sprinter Shelly-Ann Fraser-Pryce in the final IAAF Diamond League meeting of the season. Fraser-Pryce had won the 200m Diamond Trophy with victory in Zurich the previous week, and her overall victory was already guaranteed in the 100m, but that didn’t stop her from going all-out in the Belgian capital. Her winning time of 10.72 – into a -0.3m/s headwind, no less – was the third-fastest clocking of her career and broke the 16-year-old meeting record. She thus achieved something that even Bolt has not yet managed to do – winning the Diamond Race in both the 100m and 200m in the same season. The men’s 100m was not a Diamond League discipline in Brussels on this occasion but Bolt made it a third win in a row as he stopped the clock in 9.80, just 0.04 shy of his own meeting record from two years ago. World silver medallist Warren Weir was the third sprint winner from Jamaica, edging ahead of compatriot Nickel Ashmeade to win the 200m in 19.87 to succeed Ashmeade as the Diamond Race title-holder. World champion Mohammed Aman came to Brussels with a lead in the 800m Diamond Race that could not be beaten, but pushed himself to a national record of 1:42.37, bettering the previous mark by almost a full second. By winning the 3000m steeplechase in Brussels, world champion Milcah Chemos became the first athlete in history to win four Diamond Race titles in a row in the same event. Moments later, pole vaulter Renaud Lavillenie replicated her achievement. There were just two athletes left in the hunt for the Diamond Trophy in each of the men’s 5000m, 400m hurdles and women’s high jump. The Ethiopian pair of Hagos Gebrhiwet and Yenew Alamirew were vying to cross the line first in the 5000m, and the latter managed it to secure the big prize, winning in 12:58.75. 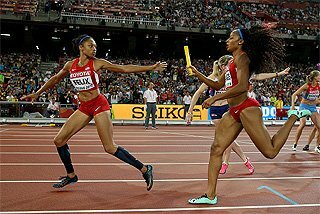 Third place in the 400m hurdles – one ahead of his Diamond Race rival – was enough for Javier Culson, and in the women’s high jump the world champion Svetlana Shkolina continued her unbeaten run this season to beat fellow Russian Anna Chicherova to the Diamond Trophy. Sandra Perkovic, already Diamond Race winner in the discus, earned victory with 67.04m, thus joining 400m hurdler Zuzana Hejnova as the only athletes to win all seven Diamond League competitions this season. World shot put silver medallist Ryan Whiting also had an unassailable lead in the Diamond Race, but won nevertheless with 21.45m. Also assured of the overall prize were 100m hurdler Dawn Harper-Nelson and Sweden’s world 1500m champion Abeba Aregawi, The former won with a season’s best of 12.48; the latter maintained her unbeaten run in a time of 4:05.41. 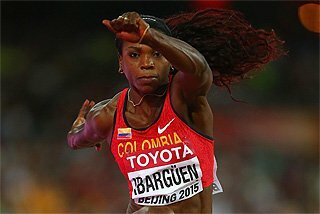 World triple jump champion Caterine Ibarguen was another athlete who simply had to turn up in Brussels to confirm that she would receive her Diamond Trophy, but the Colombian also ended her season on a victorious note, recording 14.49m. Vitezslav Vesely and Christian Taylor finished second in the javelin and triple jump respectively, but secured Diamond Trophies nevertheless. Vesely was beaten by World silver medallist Tero Pitkamaki, 87.32m to 86.67m, while Taylor gave best to France’s Teddy Tamgho. Amantle Montsho, beaten in the women’s 400m, was also a winner overall.